In the course of the EJOLT project, the CRIIRAD laboratory conducted in May 2012 radiation monitoring activities in the surroundings of the uranium mine commissioned by Paladin Africa Limited (PAL) in Kayelekera (Malawi). Radiation monitoring training activities were also performed with CFJ (Citizens for Justice) and the local communities in Kayelekera. CRIIRAD discovered hot spots in the environment of the mine and a high uranium concentration in the water flowing from a stream located below the open pit and entering the SERE river. Results that relate to the radiological monitoring of the environment performed by the company are kept secret. The company should publish on its web site all environmental reports. No property right can be invoked to prevent public access to Paladin environmental reports (especially as Malawi State holds 15 % of the shares of the uranium mine). It is shocking to discover that million tonnes of radioactive and chemically polluting wastes (especially tailings) are disposed of on a plateau with very negative geological and hydrogeological characteristics. This report will be used during new training and sampling activities to be performed by CRIIRAD and CFJ in February 2015. How to cite: Chareyron, B., 2015. 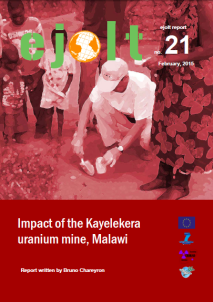 Impact of the Kayelekera uranium mine, Malawi. EJOLT Report No. 21, 77 p.
I am working with the Chairman of the Uraha Foundation Malawi, Kapote Mwaksungura who is very interested to get a full copy of this document. I have not been able to locate the download button. Have I missed something here?